Fish have been on Earth for over 500 million years, long before even the dinosaurs roamed the planet. There are over 25,000 species of fish which is more than all the species of amphibians, reptiles, birds and mammals combined and are divided into 3 main groups. They are the jawless, the cartilaginous (KAR-ti-LAJ-i-nus) and the bony fish. Jawless fish are the last survivors of the world’s first vertebrate (VUR-ta-bret) animals, which means “back-boned”. They lack both scales and jaws. Dating from over 500 million years ago, only the Hagfish and Lamprey Eels remain. Cartilaginous fish developed about 100 million years later, ancestors of today’s sharks. The skeleton of these fish is made of cartilage (KART-laj), which is not as hard as bone. These fish have jaws, as well as teeth which are usually hard and sharp. Their bodies are covered with hard scales. Bony fish—fish with bony skeletons—appeared at the same time as cartilaginous fish. They are the largest group, with about 20,000 species. These fish have an organ called a swim bladder which gives the animal buoyancy (BOY en-see), the ability to float. All fish live in water and breathe with gills. Fish are cold-blooded, which means their internal body temperature changes as the surrounding temperature changes. 40% of all fish species inhabit freshwater, yet less than .01% of the earth’s water is freshwater. Some fish are able to absorb oxygen from the air and crawl overland using strong pectoral fins. Some fish don’t posses an air bladder to help keep them afloat and must either swim continually or rest on the bottom. Some fish make sounds by grating their teeth and others make sounds from their air filled swim bladder. Some species of fish can fly (glide), others can skip along the surface and others can even climb rock. The largest fish is the Whale Shark which can reach 50 feet in length. 91% of tropical fish sold in the United States are harvested from the wild in Africa, Asia, Central and South America. Fish have excellent senses of sight, touch, taste and many possess a good sense of smell & hearing. 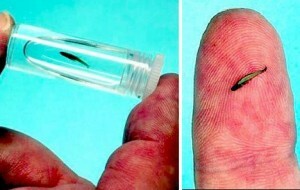 The world’s smallest fish is the Paideios (“Paedocypris progenetica”) from Indonesia, with mature females measuring 7.9 millimeters (0.31 inches). A member of the carp family, it has a translucent body and a head unprotected by a skeleton.